Three months before beginning their defense of their Women's World Cup title, American players escalated their legal dispute with the U.S. Soccer Federation over equal treatment and pay. 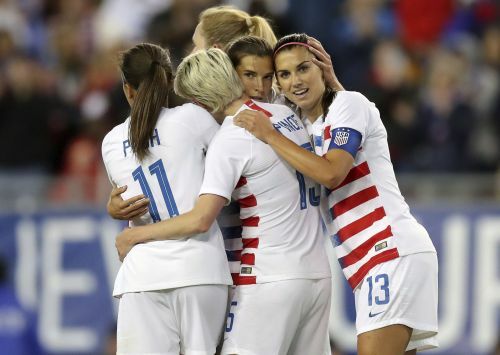 Players filed a federal discrimination lawsuit against the federation Friday, alleging ongoing "institutionalized gender discrimination" that includes unequal pay with their counterparts on the men's national team. The women's team has often championed equal rights issues and sought more equitable pay during collective bargaining two years ago. "I think a lot of people look to us and our team and the collective voice that we have and what we've stood for, for inspiration and for power, and as an ally in this broader fight for equality and human rights, really," said winger Megan Rapinoe, a co-captain and veteran of 149 international appearances. The 28 members of the current women's player pool filed the lawsuit in U.S. District Court in Los Angeles under the Equal Pay Act and Title VII of the Civil Rights Act. The lawsuit, which seeks class-action status, was filed on International Women's Day. "We believe it is our duty to be the role models that we've set out to be and fight to what we know we legally deserve," forward Christen Press told The Associated Press. "And hopefully in that way it inspires women everywhere." The U.S. Women's National Team Players Association is not party to the lawsuit but said in a statement it "supports the plaintiffs' goal of eliminating gender-based discrimination by USSF." The men's and women's U.S. national teams have separate collective bargaining agreements, and their pay is structured differently. That means there is no dollar-to-dollar salary comparison. The lawsuit claims that from March 2013 through Dec. 31, 2016, when the previous collective bargaining agreement expired, players on the women's team could make a maximum salary of $72,000, plus bonuses for winning non-tournament games as well as World Cup appearances and victories, and for Olympic placement. "A comparison of the WNT and MNT pay shows that if each team played 20 friendlies in a year and each team won all 20 friendlies, female WNT players would earn a maximum of $99,000 or $4,950 per game, while similarly situated male MNT players would earn an average of $263,320 or $13,166 per game against the various levels of competition they would face," the lawsuit says. It concludes that a top-tier women's player would make only 38 percent of a similarly situated men's player. A pay disparity was very apparent at the World Cup: In 2014, the federation gave the men's roster a performance bonus of nearly $5.4 million after the U.S. went out in the round of 16 in Brazil. The women's team received a bonus of $1.72 million after winning the 2015 World Cup in Canada. Compensation for the women includes a guaranteed salary and also salaries paid by the USSF for their time with clubs in the National Women's Soccer League. The men get paid based on roster selection for appearances for friendlies and tournaments. While star players on the women's team, like forward Alex Morgan, can make as much as their male counterparts because of endorsement deals, the disparity becomes greater for players with lesser profiles. Kathryn H. Ruemmler, a lawyer representing the federation, wrote in a May 2016 letter to the EEOC that over the previous four years, women's national team players averaged almost $280,000, a figure $90,000 more than men's national team players. She pointed out that women receive benefits the men don't, including severance pay, medical insurance, maternity leave, child care and a relocation allowance. Ruemmler also said men's games generated about $144 million from 2008-15, while women's matches generated $53 million, and television ratings for men's games from 2013-15 averaged twice the figure for women's matches. But those figures were for years prior to the women's 2015 World Cup victory and also did not include the men's failure to reach the 2018 World Cup. The women's team brought in $6.6 million in profit in 2015, compared to less than $2 million for the men's team. The lawsuit filed Friday seeks "an adjustment of the wage rates and benefits" for the women. "At the heart of this whole issue we believe that it's the right thing. We believe that there has been discrimination against us," Rapinoe said. "And while we have fought very hard and for a long time, whether that be through our CBA or through our players association, putting ourselves in the best possible position that we can to get the best deal that we can, we still feel that we don't have what we're trying to achieve, which is equality in the workplace."